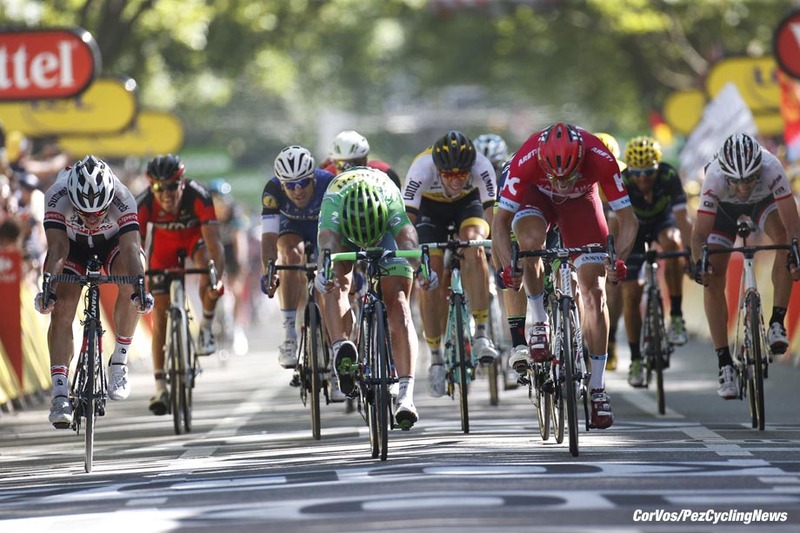 PezCycling News - What's Cool In Road Cycling : TDF’16 St.16: Sagan’s Surge To Victory! 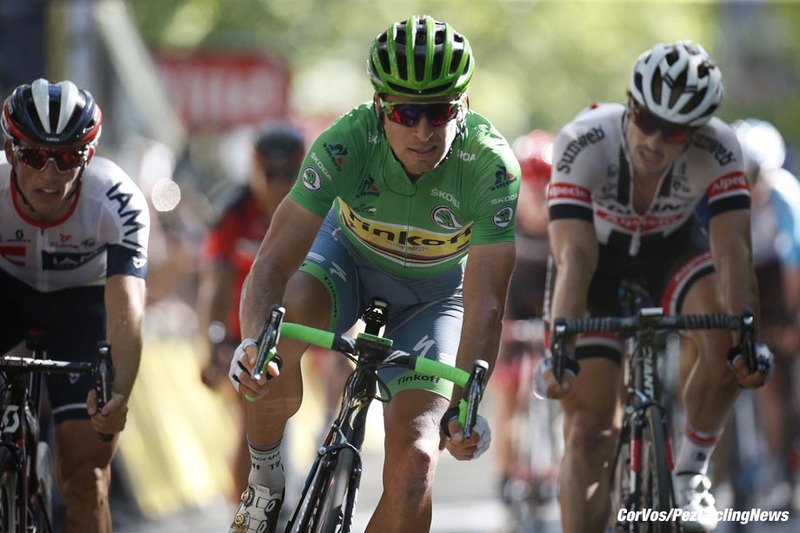 TDF’16 St.16: Sagan’s Surge To Victory! All the top one-day guys were in the mix: Valverde, Degenkolb, Matthews, Vanmarcke, Cancellara, Van Avermaet, Boasson Hagen and even Mark Cavendish survived a blistering final run to the line. Sagan, though, was the strongest and the smartest, flicking his front wheel over the line for the win. How it went down: A nice day in the sun, and a day to remember for Fabian Cancellara? The Swiss legend was getting a chance to hit home roads in his final Tour de France, as the race moved from Moirans-en-Montagne to Berne. 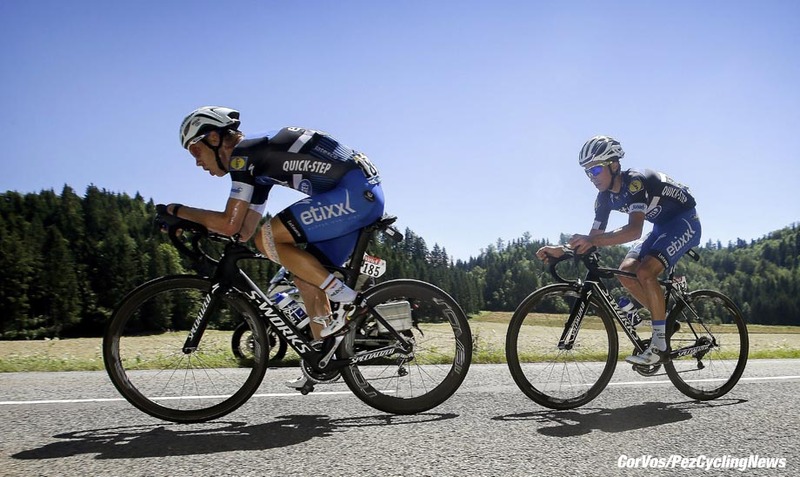 With a rest day in the offing, and then four nightmare days in the Alps, the peloton seemed contented when Tony Martin and Julian Alaphillipe from Etixx - Quick-Step took off. To be frank, it was Tony doing the bulk of the hard work, with his younger team-mate giving him the occasional breather. Four men countered but hung in no man’s land for an age as Martin kept the hammer down and the speed high. The chasers were Vegard Breen from Fortuneo-Vital Concept, Cofidis’ Nicolas Edet, Lawson Craddock for Cannondale-Drapac, and Timo Roosen representing LottoNl-Jumbo. The chase was pretty much undertaken by BMC (heading for home turf), Direct Energie and Katusha, who got serious once the gap nudged out towards six minutes. 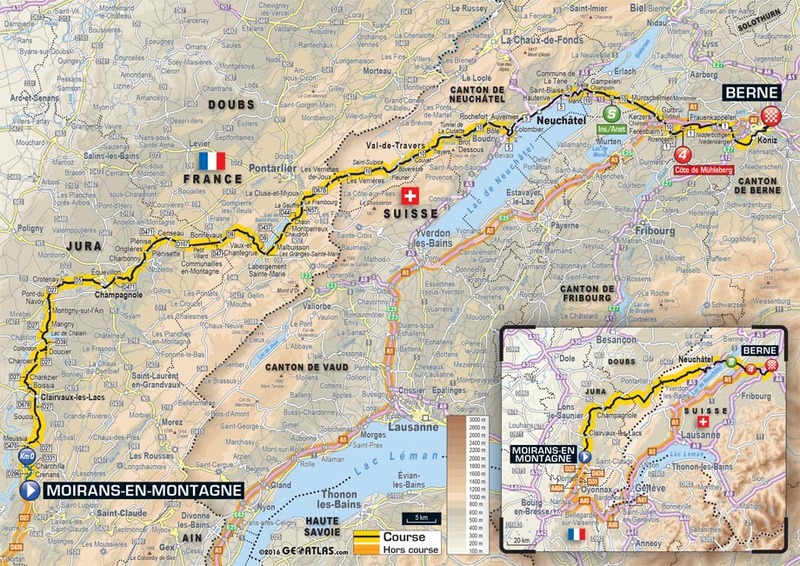 Just beyond half-distance, and the Martin-Alaphilippe trans-border express ploughed into Switzerland with a lead of just under five minutes. The main field was keeping a close enough watch that the gap kept withering away. So much so that the counter-attackers gave up their futile mission and were swept up not long after half-way. 45 kilometers left and Martin’s time trialling was holding the main field at two minutes. The big German had his arms draped over the bars, rolling a big gear, with Alaphillipe spinning quickly in his wake. The Etixx - Quick-Step duo took the intermediate sprint and then the main field crossed about 90 seconds later: there was no contest for the third-place points with Sagan cruising through ahead of Cavendish (Dimension Data) and Coquard (Direct Energie). Martin and Alaphillipe continued their fools’ errand, with a lot of chit-chat along the way, the young Frenchman patting his mate on the back as they rolled up a small climb inside the last 30 kilometers. 25 clicks remained when Alaphillipe just couldn’t hang on any more; a steep slope dragged the Frenchman back towards the peloton as Martin smashed away. 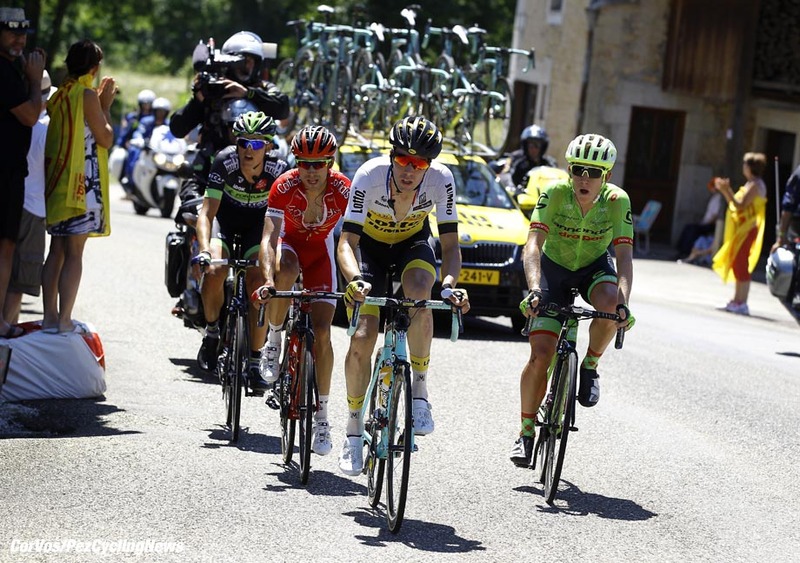 Dimension Data, Direct Energie and BMC were prominent at the front of the main field by now. Marcel Kittel (Etixx - Quick-Step) looked on a less than brilliant day, blown out the back inside the last 25 kilometers, with Iljo Keisse pacing him, and the also-dropped Alaphillipe making it a trio. Astana upped the speed with 22 kms left, which did for the brave Tony Martin. 21 to go, and ex-world champion Rui Costa (Lampre-Merida) jumped away. Given his long-standing love affair with this country (three consecutive Tours of Switzerland won), it was perhaps inevitable that he’d try something. 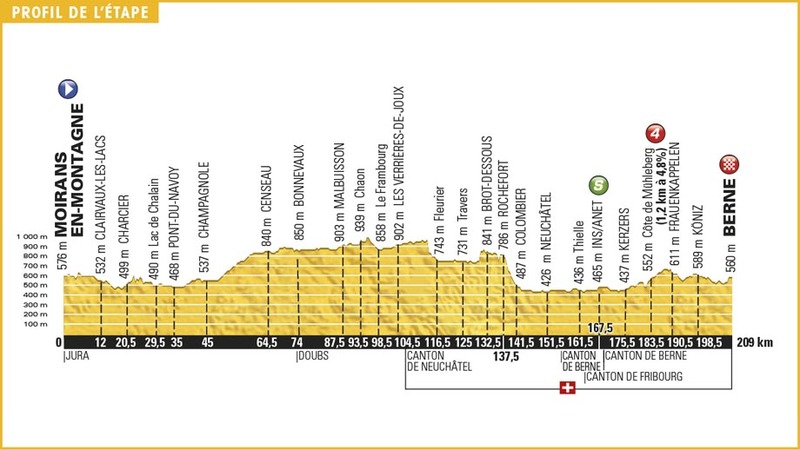 Now the final kilometers got harder, maybe not hilly but certainly rolling. Costa had a grimace cemented onto his face as he hit eight clicks to go, holding twelve seconds. Five kilometers left and the main field splintered with Costa being picked up seconds later. The peloton was lined out, the speed from Giant-Alpecin’s Warren Barguil at maximum as the field hit a short cobbled section. Up into the old town center, the road twisted and turned skywards. Inside two kilometers to go, the Classics men Vanmarcke (LottoNl-Jumbo) and Cannondale-Drapac’s Navardauskas pushed clear desperately. Barguil led for Giant-Alpecin under the red kite. Suddenly, Valverde (Movistar) opened on the left and it was a sprint royale and a desperate bike throw for the line... Sagan edging it. Froome was in the front group, but maybe not looking totally at ease on such a run in. Rest day tomorrow, but keep it PEZ for all the latest ahead of the Alps from Ed Hood 'Roadside' in Switzerland! 25. Stef Clement (Ned) IAM Cycling. 25. Tanel Kangert (Est) Astana at 38:12.